[Updated, 10:50 am ET] Alder Biopharmaceuticals rode a big deal with Bristol-Myers Squibb to the public markets earlier this year, where it’s seen its value climb by more than 30 percent. Starting today, however, the Bothell, WA-based company is going to move forward without that safety net. 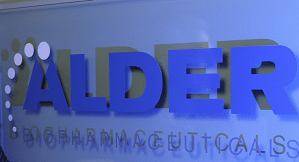 Alder (NASDAQ: ALDR) said today that following a portfolio review, the big New York drugmaker has decided to end the deal it has in place with Alder for the rheumatoid arthritis drug prospect clazakizumab. On one hand, Alder will now own all of the rights to clazakizumab and its migraine drug, ALD-403, and the potential profits that could go with them—something executives tried to stress on a conference call with analysts this morning. “We’re excited about this development and think it represents a significant opportunity for Alder,” president and CEO Randall Schatzman said on the call. On the other hand, however, Alder, a roughly 80-employee company, now may have to foot the bill for a big, costly Phase 3 study, or find a new partner to take on those costs. What’s more, Alder will now lose out on the $1 billion-plus in milestone payments it had been eligible to receive under the deal it cut with Bristol in 2009 (the company had brought in $103.5 million in payments from that deal as of March). And, deserved or not, there is always a stigma attached to a drug that Big Pharma gives up on. Wall Street took the decision as a bad sign—Alder’s shares sank about 9 percent in early trading following the news. Alder didn’t give much insight as to why Bristol changed its tune on clazakizumab, only noting that it was because of a “portfolio prioritization.” Schatzman said it wasn’t as if Bristol saw any new safety or efficacy data, or technical issues and balked, however. Alder presented positive Phase 2 data for the drug last year. [Updated with comments from Bristol-Myers] A Bristol spokesperson told Xconomy that despite the efficacy clazakizumab showed in Phase 2, “the projected profile” of the drug “did not meet [Bristol’s] criteria” to start a Phase 3 trial. “This decision was not based on any new or unexpected efficacy or safety data, but instead followed the company’s determination that clazakizumab did not warrant further investment based on other priorities in our pipeline,” the spokesperson said, adding that Bristol still plans to develop new treatments for rheumatoid arthritis both from within its own pipeline and through deals. Given that assessment from Bristol, the question is where Alder will now go with clazakizumab. The drug is an antibody that binds to the inflammatory protein IL-6, and Alder had handed all the rights to clazakizumab for all potential uses except cancer to Bristol as part of their deal. The two companies have been developing clazakizumab to treat rheumatoid arthritis, trying to create an alternative to the blockbuster biologic drugs adalimumab (Humira) and etanercept (Enbrel), which work by binding to a different protein, tumor necrosis factor. Alder was able to take itself public, in part, because of Bristol’s validation and the future dollars that could’ve come in from clazakizumab’s progress. Schatzman said on the call this morning that the company will now review its options for clazakizumab going forward—which may include finding a new partner. Alder also owns full rights to a its migraine drug prospect, ALDR-403, and Schatzman said the drug’s progress won’t be impeded by Bristol’s decision. The company had about $80.3 million in cash on hand as of June 30. “I think it would be fair to say that we will be considering various ways that we may take this forward that make more sense for Alder as a small company, and do so as a both expeditious and cash-conserving way,” he said.